The Butterfly Park in Bannerghatta National Park is filled with loads of cool stuff and is a treasure trove for photographers and enthusiasts alike. It also is a nice getaway from the city. Opened in 2006, the park is India’s first. The butterfly park in the zoo has a conservatory, an audio-visual room and a museum. If you’re a butterfly lover or love to use a camera, you’ve got to come here for some cool shots and look around to spot these beautiful creatures. And inside, there are almost thirty species of butterflies. But, that could rise or fall depending on the season too. It is even climate controlled, with an artificial waterfall and fauna apt for butterfly culture. 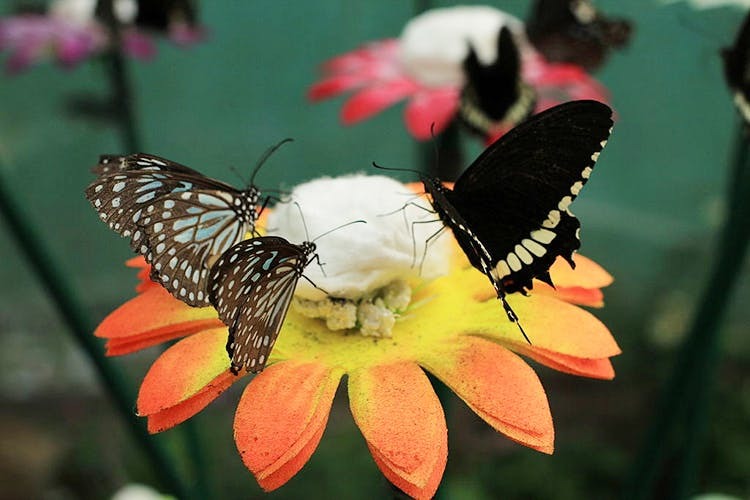 In the butterfly museum, you can learn about the life cycle of the butterfly and so much more on butterflies and there is even an exhibit of carefully preserved butterflies here. The artificial waterfall here is one of the main attractions. The last stage of the park just before the exit is a theatre, where you can watch a documentary on butterflies and how you can do your bit to conserve and save the species. After you’ve exited the enclosure, there’s a lot of things you can still do at the Bannerghatta Biological Park. You can go on a safari, visit the elephant sanctuary, the zoo, the aquarium, a pet corner, an animal rescue centre and a snake park too. The park is a popular spot for a Sunday outing with the family and even for trekking and hiking.